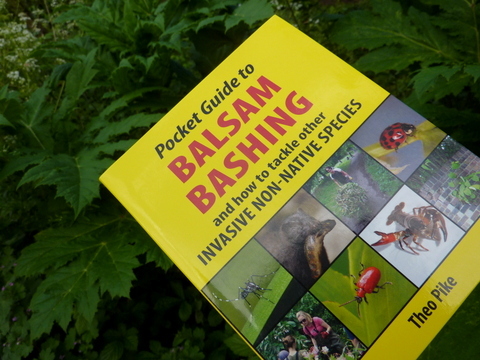 We are very excited to announce the recent publication of a new book by our Chairman of Trustees, Theo Pike, entitled ‘The Pocket Guide to Balsam Bashing – and how to tackle other Invasive Non-Native Species’. This ground-breaking 96-page handbook includes more than 40 invasive non-native species (INNS) such as Himalayan balsam, giant hogweed, Chinese mitten crabs, signal crayfish and mink, with practical advice on how individuals and community groups like ours can take action against them or stop them spreading further. Even reporting a sighting of oak processionary moths or Asian longhorn beetles can make a big difference to protecting our natural biodiversity, and there is also a section on biosecurity measures like Defra’s Check-Clean-Dry advice. Best of all, since this book was partly inspired by the work of the Wandle Trust and our wonderful volunteers, you may even recognise yourself in one of the photos. Copies of the ‘Pocket Guide to Balsam Bashing’ are available direct from the publishers, Merlin Unwin Books, or you can buy a signed copy from Theo at one of our community balsam bashing and river cleanup events! This entry was posted in Uncategorized and tagged Books, INNS, People, Spreading the Wandle Word, Wandle on May 20, 2014 by Bella.